In conjunction with our ongoing efforts to engage the Internal Medicine community about the Maintenance of Certification (MOC) program, we have been listening to and acting on your suggestions regarding the ABIM.org website. This past year, we conducted a number of user tests with a range of physicians to better understand what is needed from our website and online tools. The feedback received was clear: physicians want ABIM’s website to make their lives easier, not harder. The ABIM.org online experience needs to be simplified. Therefore, we plan to update a large portion of ABIM.org in 2016, making it easier to use and more responsive to physician needs (for example, it will become more accessible on mobile and other devices). We didn’t want to wait for that more comprehensive overhaul to begin making a few incremental changes that we hope will help physicians visiting our website. One change you may notice immediately is the updated MOC requirements page. Physicians told us that this page was too cluttered and text-heavy, and from their feedback, we streamlined the page with succinct, clear content and visuals. See the before and after, below. 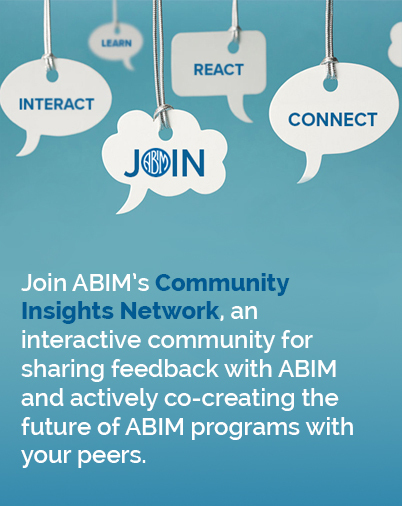 We hope this page, and all other future updates and redesigns, will enhance the online experience for physicians on ABIM.org and we look forward to continued dialogue with the community to ensure that our efforts reflect your needs. Be sure to subscribe for regular updates from the Transforming ABIM blog and please e-mail your thoughts to rbaronmd@abim.org as we continue to collaborate with the Internal Medicine community to ensure that both MOC, and the tools you use to engage in the MOC program, are user-friendly, meaningful and relevant.